The rhubarb gives this lightly sweet-hot salsa some extra crunch you will love! Prepare the rhubarb the night before. 2 med. stalks of rhubarb thinly sliced leaves and base discarded! Bring sugar and water to a boil over medium high heat. Stir gently to dissolve sugar, then boil for five minutes. Add a large handful of cilantro and the lime zest and boil for five more minutes. Strain the cilantro lime syrup into a mason jar. 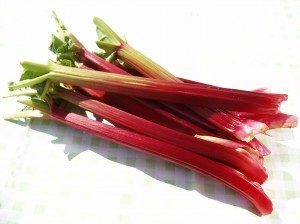 Allow to cool for 15 minutes, then add the sliced rhubarb. Cool an additional hour, then refrigerate overnight. The next day, rinse and gently pat the strawberries dry, then remove the tops if desired. Dice the strawberries into 1/2 inch pieces and add to a bowl. Drain the rhubarb and dice into 1/4 inch pieces, and add to the strawberries. Then add at least 3 tablespoons minced shallot and serrano chili (seeds removed if you want to avoid some heat), one large handful finely chopped cilantro. Add smoked sea salt to taste, then chill before serving with crispy tortilla chips.